On Tuesday I debuted Murphy's Laws of Project Management, where I discussed stories and lessons learned from 5 different laws (out of a current total of 25, and growing). The audience received some very strong lessons based on real world PM experiences and a workbook full of worksheets, checklists, and acronyms to help them avoid those five pitfalls. They also, hopefully, joined AA (no, not Alcoholic Anonymous, but Accountability Advisors, something new I am working on) to help with delegation inside their project teams. This should be the first of a series of presentations (and possibly a book) which I am very excited about. 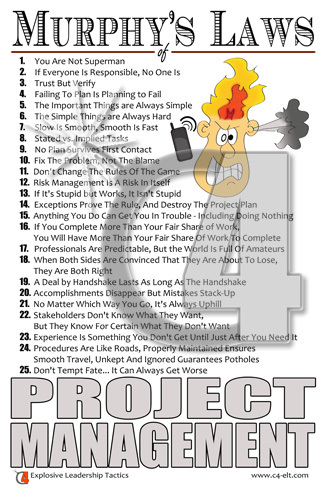 As a note: How would you like a copy of my just released Murphy's Laws of Project Management poster (which is currently available only at my sessions)? I am still looking for Project Management stories for this topic, so if you are willing to take a 1 page survey and share you story, let me know at: mmorey@c4-elt.com. If I choose your story for a presentation or the upcoming book I will give you a copy of my Murphy's Law poster. My second session was Multitasking: A True Road to Career Effectiveness. This is my most popular workshop, because the audience not only learns the truth about Multitasking, but also some tactics that can improve their effectiveness; ready to execute immediately. Can you imagine being more effective? Getting things done quicker and not constantly distracted by the bombardment of little red hot issues, which are really only annoyances? The audience doesn't have to imagine, they know! This time the attendees received a bonus from my program: A workbook detailing out steps to modify Outlook and Smartphones, app recommendations, and worksheets to set priorities. Basically, the tools needed to stop feeding the addiction of distraction. Based on initial comments, the workbook may need to become a permanent addition to the presentation. Another friend Eddie Merla from Duende Project Management presented: Change Your Language, Improve Your Project; where he discussed the power of word choices and the impact of those choices on your team. The conference also hosted well known and notable presenters like the 2000 International Speech Champion Ed Tate, who was the opening keynote, and presented: Influence Without Authority: How to Achieve Breakthrough Results! (because no leader would ever be in a position of responsibility without authority, right?). In the end, I got to have several conversations with Ed; and while short, I learned quite a bit. Moving away from the conference, over the weekend I plan on editing some more videos for the YouTube Channel (maybe even some from my sessions), as well as perhaps another surprise. C4 is experiencing explosive growth, and I am excited to continue the expansion. Just watch what happens next!